Appreciating the work of numerous developmental scientists (Loevinger, 1976; Kohlberg, 1981; Gilligan, 1982; Piaget, 1972; Freud & Strachey, 1960; Fowler, 1981; and many more), as well as the study of multiple intelligences (Gardner, 1983) and emotional intelligence (Goleman, 1995), Wilber (2000) identifies various lines of development, each of which involves movement through increasingly complex structural stages expanding strengths in particular areas. Together, these developmental lines play a role in one’s overall developmental level of awareness. Interaction between the individual and the collective facilitate this developmental process (Wilber, 2000). Esbjorn-Hargens (2009) provides a helpful overview of Integral Theory. Thus, Integral Theory is a comprehensive map useful in considering various dimensions of complex social problems faced in the 21st century. The Integral Theory framework is also known as “AQAL.” This stands for all quadrants, all levels, all lines, all states, and all types. The upper quadrants represent the individual, and the lower quadrants represent the collective. The right quadrants are aspects that can be observed about the individual or the collective. The left quadrants represent subjective and inter-subjective aspects about which we would need to ask questions to discover. Any occasion can be viewed from these interior and exterior perspectives on the individual and collective. While it may appear that the quadrants are interacting, they are actually co-arising. Developmental researchers have found that people need to work through one stage of development in order to move on to the next. Each developmental stage transcends and includes earlier stages, and developmental milestones cannot be skipped. We also know that researchers have explored many aspects of development. 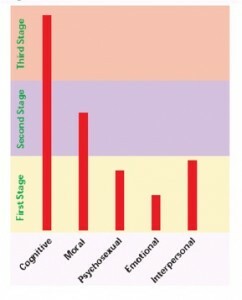 The graph below depicts just a few known lines of development. Recognizing these multiple lines, we can see that development is really quite fluid – people possess their own unique strengths in a variety of areas. 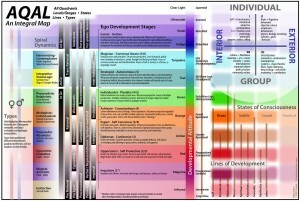 While developmental lines are often “uneven,” Integral Theory suggests that looking across lines of development can reveal a general level of overall consciousness development. 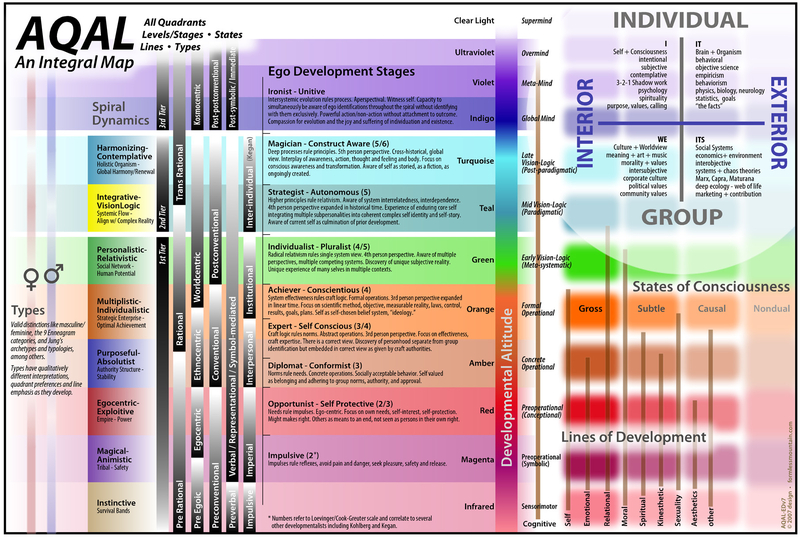 Since we would need to ask questions to determine an individual’s developmental capacity, consciousness is mapped to the upper left (UL) quadrant. 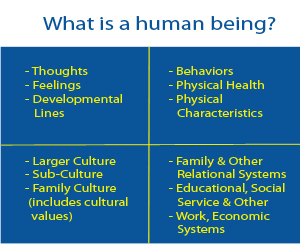 Yet, these capacities are reflected in one’s behaviors and collective interactions, which are mapped to the other quadrant perspectives. As a post-disciplinary framework that transcends and includes the theoretical bases of existing disciplines and professions, Integral Theory is being applied across disciplines and professions. Many are finding that the Integral map fosters the ability to take multiple perspectives and combine approaches for a more powerful impact on serious social problems ranging from climate change, “culture wars”, and homelessness. Furthermore, with the support of this comprehensive map that appreciates and includes the contributions of all perspectives, Integral leaders are capable of guiding post-disciplinary, transdisciplinary, multidisciplinary, and interdisciplinary teams.